Students from Brooklyn take part in a partnership with SUNY ESF to learn about science first hand. A group of students from New York City is spending the week enjoying Central New York’s slower pace and environment. The students are part of a program that might just launch them into science careers. WAER's Chris Bolt reports on the program that expands students' thinking about science, possible college majors and careers. The 19 rising juniors from Brooklyn probably don’t often go to a classroom that looks like the one here on Onondaga Lake. They took part in a research project to catalog what kind of fish were caught in a big net. 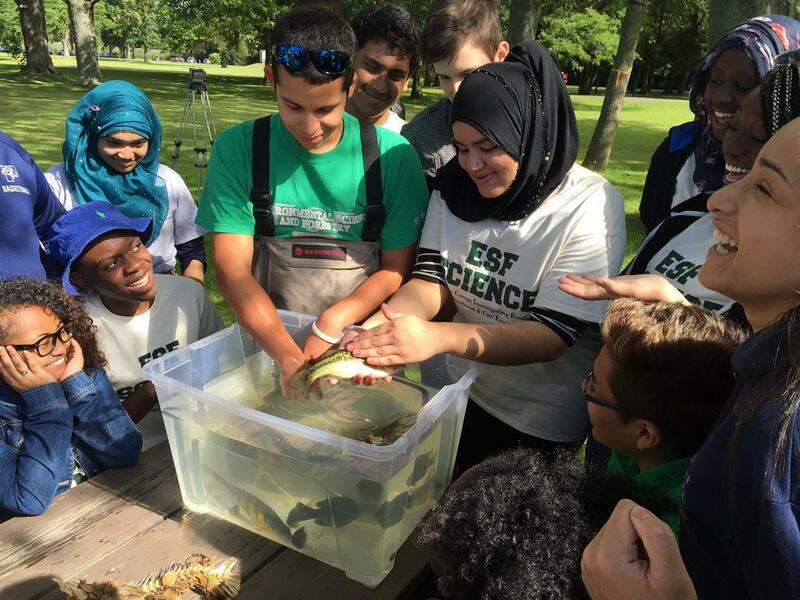 The hands-on activities included identifying fish species that were netted in Onondaga Lake, in addition to learning aspects of fish evolution and behavior. They learned about the different species, adaptations, and the eco-system, as well as the lake’s recovery. Ariana Hancock and Dylan John aren’t exactly used to picking up live fish to help identify them. “I got to hold the fish and it felt so weird. I’m used to holding fish when it’s cooked, but this was a fresh fish, like it’s still living. It was nice to have this sort of life in my hand,” said Dylan. The students are part of the Sponsors for Educational Opportunity program…they chose to take part and do activities starting in 9th grade. 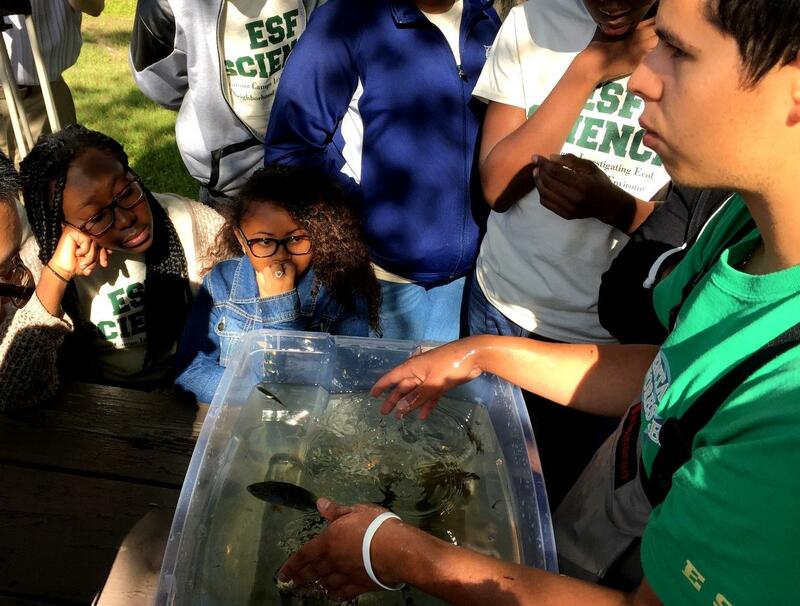 Here SUNY E-S-F students helped them through a variety of activities and environments, as part of the ESF SCIENCE program: Summer Camps Investigating Ecology in Neighborhood and City Environments. Training Coordinator Brandon Murphy and the college students are sharing their passion. Many of the students are from immigrant families, or from single parent and low income homes…and more than four out of five will be the first member of their family to attend college. Local dignitaries and residents took the plunge on Wednesday into the warm waters of Onondaga Lake. What was once considered one of the most polluted lakes in the nation, now meets the official standards for being swimmable. 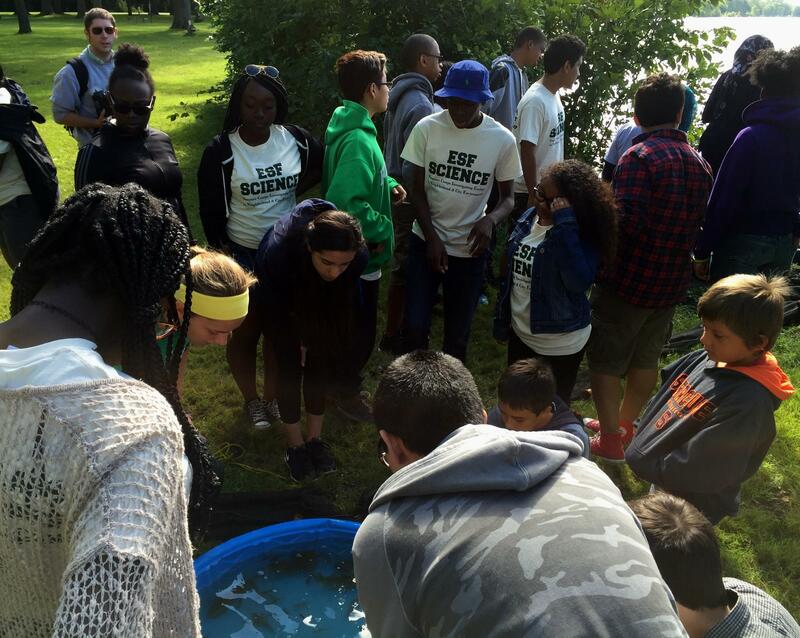 Eighty Syracuse-area middle school students have spent the past week gathering water and soil samples, catching insects, observing fish, and studying mud boils in Tully to learn more about the Onondaga Lake watershed. It’s the tenth year of Honeywell's Summer Science Week, which is organized by the Museum of Science and Technology. Solvay 8th grader Sidney Chafee wants to go into marine biology or a related field. She enjoyed learning about the restoration of the lake’s wetlands after decades of pollution.